Having a home or building inspection performed is, quite commonly, one of the crucial steps in purchasing a property. Buyers and developers want to make sure they are not going to end up buying a property that may have structural problems or which needs costly repairs or updates. This is especially true if they are looking for development opportunities that will allow them to make a fairly quick profit. If you are planning on demolishing an existing structure and performing a complete rebuild, you do not need to worry as much about structural issues. The same is true of parcels of land which are currently undeveloped. That does not mean there will not be some sort of surveying or inspection carried out in these cases, it is just that the condition of the building itself is not as much of an issue. 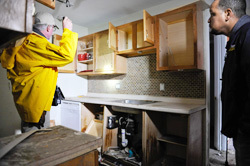 There are many companies that offer home or building inspection services. Some are quite competent and you can trust them to give you an unbiased and clear view of what exactly may be wrong with a property that seems to be in good condition. Other companies and individuals may not be as trustworthy. Horror stories abound of individuals who trusted their home inspector and found out too late they should have avoided a particular property. It is important that you speak with an inspector prior to hiring them. If you are able to meet with them before the home inspection in order to feel them out this may help you choose one who is more honest about what is going on behind the walls of a home or other building. If you are meeting them for the first time at the property for the inspection itself it is too late for you to choose another provider without the real estate deal potentially falling through. Find out how long they have been working in the home or building inspection industry. Find out how long their inspections usually take and whether they know how to perform specialized tests such as radon testing. You need to find out whether they can identify known toxins and carcinogens in the building in question such as the presence of asbestos tile. Find out what they did before they became a home inspector. Did they have experience working in the construction or contracting industries? If so, why did they change trades? You may be able to weed out individuals who have a lack of industry knowledge before they come to inspect your home. It is important for you to ensure that the inspector you are using has experience looking at the kind of building you are thinking of buying. A commercial building, for example, will likely have different issues than a home or other type of residential building would have. You should expect your home or building inspector will take a substantial amount of time going over a property. A large property should take more time to inspect than a smaller one. Make sure they look at the roof, the foundation and areas such as insulation. You want to make sure they note any structural issues or defects in the building. A good inspector will furnish you with a report covering all of the issues they noticed. If you are new to the world of property development, getting estimates for having work done can also be helpful. You want to make sure you can also get a copy of the report for the individuals who are financing your purchase as well.